Acetylcholine. The success story of identifying epilepsy genes started with familial frontal lobe epilepsies and the discovery of CHRNA4, coding for a subunit of the nicotinergic acetylcholine receptor. Ever since this initial discovery, other gene identifications have reinforced a dysfunction in cholinergic signaling as one of the key mechanisms in genetic frontal lobe epilepsies. A recent study in the Annals of Clinical and Translational Neurology now identifies a novel gene for familial frontal lobe epilepsies, coding for an anchoring protein for acetylcholinesterase (AChE), the key enzyme breaking down acetylcholine. The ADNFLE story. I was actually about to put an Epilepsiome piece on CHRNA4 together when I stumbled across the recent publication by Hildebrand and collaborators. At first, I didn’t pay too much attention to it, but when I read about the function of their candidate gene, I decided to briefly interrupt our Epilepsiome series and write about the recent publication. To me, it’s not just about this particular candidate gene – it’s about our ability to guess candidate genes by their function, which has rarely worked in genetic epilepsies. Autosomal dominant nocturnal frontal lobe epilepsy (ADNFLE) is one of the few notable exceptions where gene findings conform to a clear theme. Three genes for ADNFLE including CHRNA4, CHRNB2, and CHRNA2 are genes for subunits of the nicotinergic acetylcholine receptor. KCNT1 and DEPDC5 are the two ADNFLE genes that code for proteins not directly involved in nicotinergic signaling, suggesting that there are other mechanisms involved, as well. Publication. Hildebrand and collaborators describe a family with frontal lobe epilepsy with two affected siblings. The phenotype of the patients was more severe and slightly different from most frontal lobe epilepsies, as both affected patients had intellectual disability, they both had early onset epilepsy in childhood and had additional neurological features such as nystagmus. Both patients have nocturnal hyperkinetic seizures, a classical presentation of frontal lobe epilepsy. Combining linkage analysis and exome sequencing, the authors looked for recessive mutations. The only plausible gene they could identify was PRIMA1. Function. PRIMA1 codes proline-rich transmembrane protein that anchors acetylcholinesterase (AChE) in the outer cell surface. Acetylcholine is a neurotransmitter that is secreted into the synaptic cleft and is quickly broken down by acetylcholinesterase. In order to be at the right place at the right time, this enzyme needs to be present close to the synapse and needs to be anchored to the membrane. PRIMA1 is one of the proteins providing this anchor. Mouse models demonstrate that the absence of PRIMA1 prevents acetylcholinesterase from being present on neurons. This finding reinforces the idea that a dysregulation of cholinergic function is one of the key mechanisms in genetic frontal lobe epilepsies. This is what you need to know. 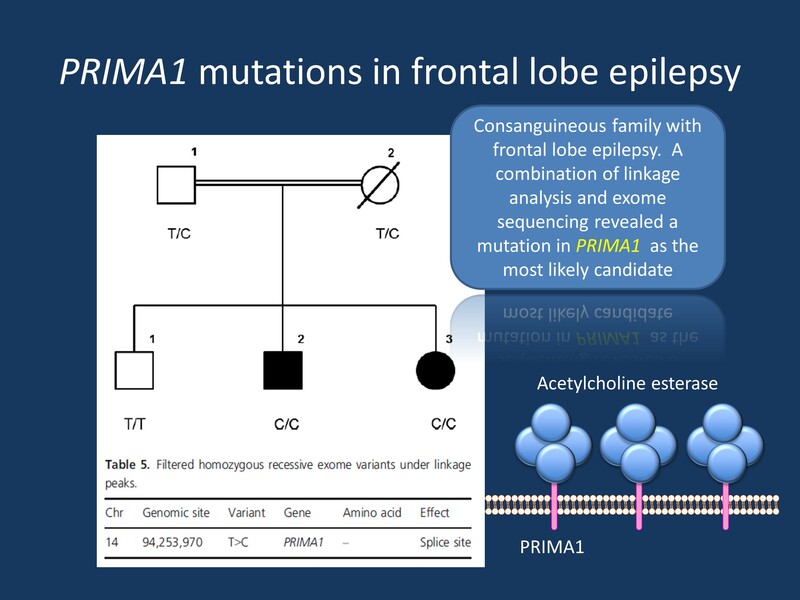 PRIMA1 is a novel gene for ADNFLE, but it seems to be a rare cause given that the researchers sequenced ~300 patients with frontal lobe epilepsies without an additional hit. It will be interesting to see whether this gene can also be identified in other families with genetic epilepsies. Confirmation in additional families will address remaining doubts whether the gene finding is causal or only represents a chance finding. This entry was posted in Publications and tagged CHRNA2, CHRNA4, CHRNB2, PRIMA1. Bookmark the permalink.